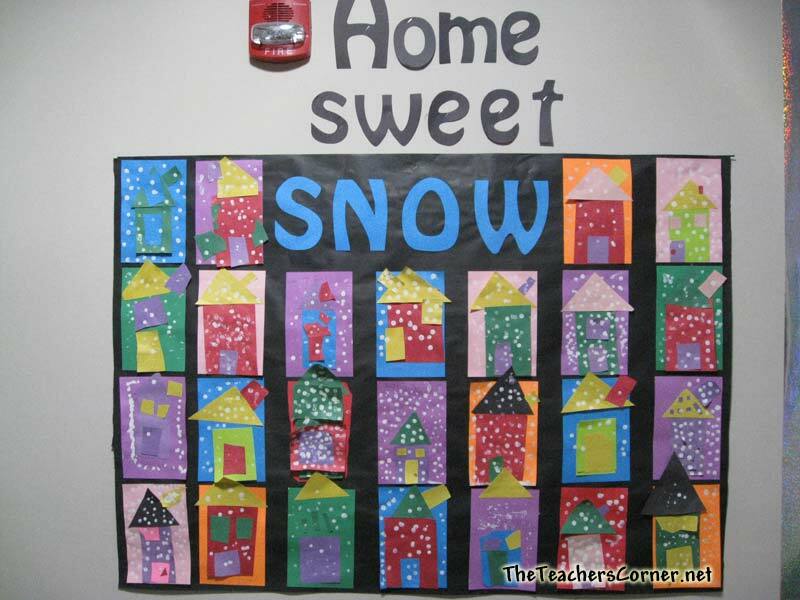 This page will provide you with ideas and resources to create bulletin boards about a number of winter related topics. 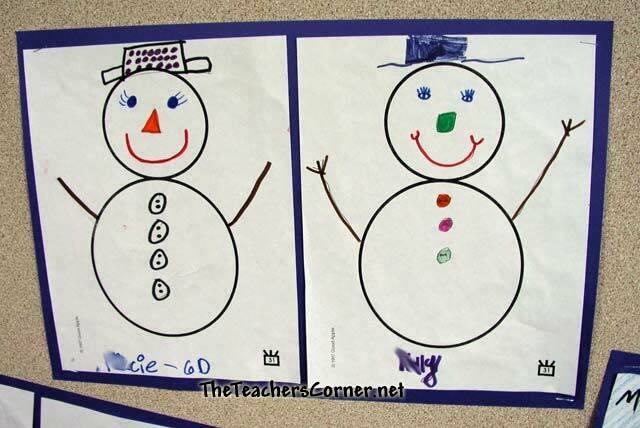 These bulletin boards will help you integrate various winter activities into your daily curriculum. 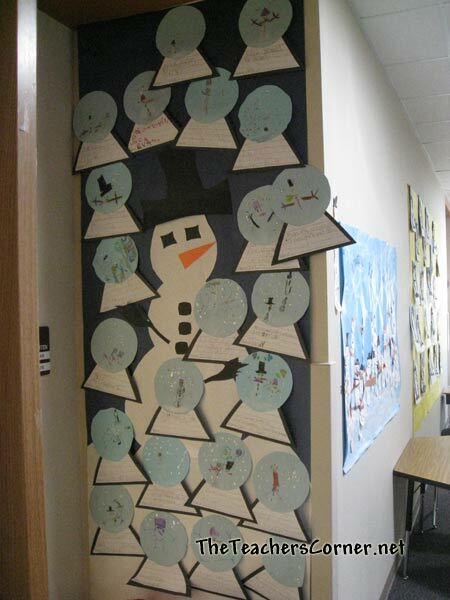 Our winter bulletin boards include the following: A board for the book "Snowballs", Q-Tip snowmen, snowman glyphs. There are also links to our other winter related bulletin boards like Christmas, and Hanukkah. We are always looking for new ideas! Your creativity can help other teachers. Make you ideas last - take a picture and send it to us! 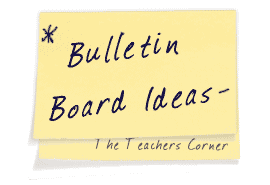 Submit your bulletin board idea and don't forget to include a photo if you have one! Let us know and we will take care to blur out any personal info in your photo. Give each student a piece of blue construction paper. You then give them Q-Tips and white poster paint. They create the snowman by "dotting" their paper. They will need black paint to add the face and buttons. Using small pieces of other colored paper, they add the hat, nose, scarf, and arms. A piece of white construction paper for each student. Black and orange tempera paint. Lined paper to attach to the construction paper. Using a paintbrush, help students paint their hands. 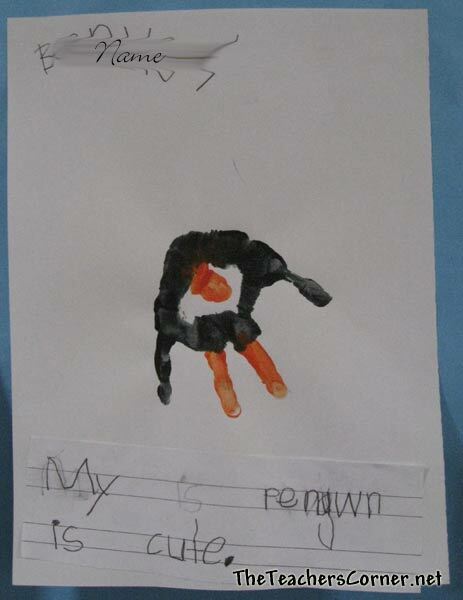 While the paint is drying, students will write a statement about their penguin. 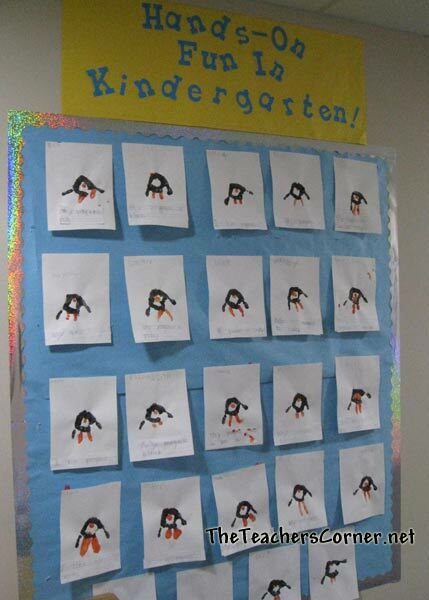 Once the paint has dried, have students glue their statement to the bottom of their penguin picture. Help your students capture the magic of winter in their own snow globes. You can easily incorporate one or more snow stories with this activity. Below you will find the patterns needed (coming soon) to create a snow globe: the globe, the base and the writing paper. Use light blue construction paper for the globe and black for the base. Ask students to decide on their favorite snow activity. They will then decorate their globe showing this scene. As students are decorating their globes, provide students with some silver glitter to add some sparkle to their globe. Once students have completed their decorating, ask them to write a description of their scene. 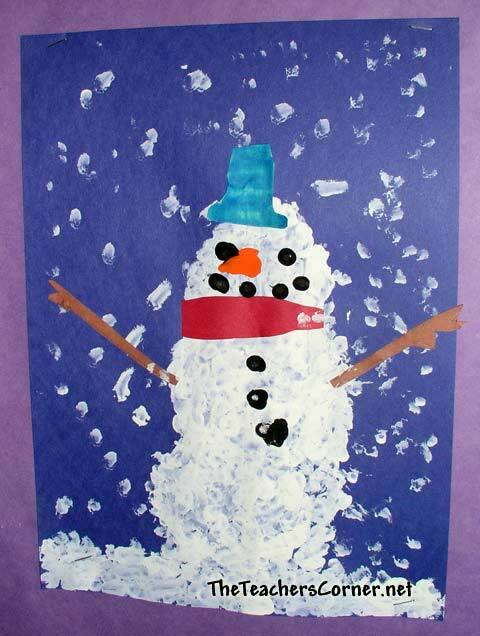 For your display, use large sheets of white paper to build your own snowman. Display the snow globes around the snowman. Students can show information about themselves using a glyph. Enlarge the key below or create one of your own. Cut various colors of construction paper in half for the background of each house. Provide students with additional pieces of various colored construction paper. They will use these pieces to cut out the squares, rectangles and triangles to build their house. Once students have constructed their houses, they are ready for the snow! Students will use white tempera paint. They can add the snow by either using their fingertips or a small, circular object like a pencil eraser or the end of a marker. Nice health suggestions to keep kids aware of spreading germs! I had the students work in cooperative groups and I gave each group a cutout of a large snowman (or woman) with no features. After reading the book "Snowballs", which shows how you can create different paper snow people, they were instructed to create a cooperative snow-person. They came out great! I gave each group also strips of different colored paper and told them they could only use paper, no crayons or pencils. Buttons would be nice add ons, too. The only rule was each person in their groups were to be responsible for at least one feature of the snow-person. The bulletin board looks beautiful and very colorful!!! December Bulletin Boards - More holiday bulletin boards including wreaths, Santa, gift trees and more. 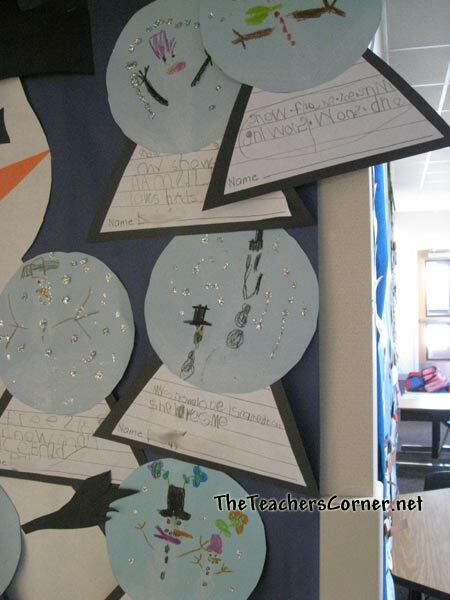 January Bulletin Boards - New Year, Snowflakes, I Have a Dream, and more ideas. February Bulletin Boards Black history, love, multicultural, and more bulletin board ideas.